This is one of those recipes – you decide you’re finally going to give homemade glazed doughnuts a try. 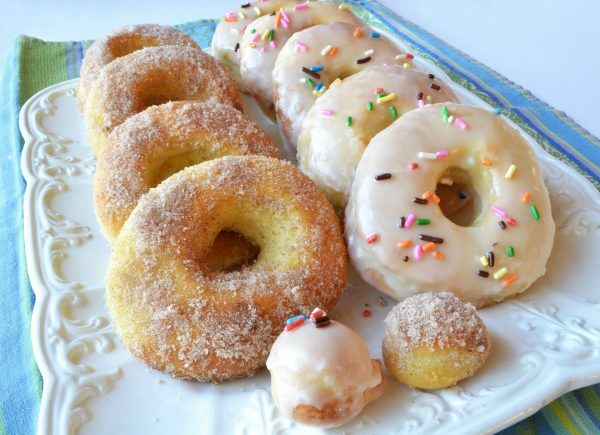 Then you sit down, pour a cup of java, purr like a kitten, and say, “Ah, now that’s a doughnut!” That was my goal when I set out to find a delicious homemade doughnut recipe. For me, it had to be the simple, classic, raised-and-glazed variety. And yes, it has to be fried to a light golden-brown and then drizzled with the old-school white glaze. Well, I’m purring like a kitten over these homemade delights. I’ll share the doughnuts with family. Just give me a bowl of homemade doughnut holes! In a small bowl, dissolve yeast in ¼ cup of the warm water. Sprinkle with sugar, gently stir, and set aside. In a large mixing bowl, cream the sugar and shortening. Add egg, salt, vanilla, and nutmeg. Mix until combined, then add yeast mixture. Add flour alternately with remaining cup of water. Use dough hook on mixer if available. Mix on low for about 5 minutes. Dough should pull away from sides of bowl. Add more flour if needed. When dough comes together in a ball, remove from mixing bowl and knead by hand on a lightly floured surface for about 2 minutes. Place dough in a large greased bowl. Cover and let it rise in a warm spot until double in size. Punch down. Let it rise and double it's size again. On a floured surface, roll out dough to ½" thick. With a doughnut cutter or 2-3" round cookie cutter, cut circles and lay on a lightly floured baking sheet. With a 1" cookie cutter, cut out hole. Cover lightly with plastic wrap and let raise for about 30 minutes. In a bowl, combine all of the glaze ingredients. Add liquid a little at a time, as needed, until you reach the desired consistency. Set aside. In a heavy skillet, pour Crisco or canola oil to a depth of 3-4 inches deep. Heat oil to between 365 and 375ºF (important to use candy thermometer and maintain temperature). Fry doughnuts and holes until lightly golden brown, turning turn over about every 20 seconds to check on browning. Drain on paper towels. While still warm, but not hot, pour glaze over doughnuts. You can also dredge your doughnuts in sugar, or a sugar-cinnamon mixture as an alternative to the glaze.